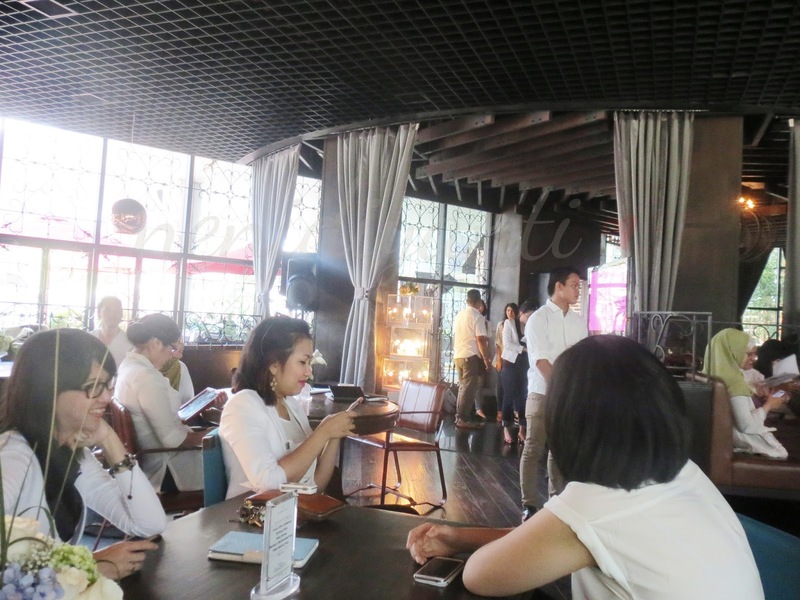 I was invited by Fashionese Daily to attend DOVE White Beauty Bar SOAPaholic Day. I was so curious about this event since the invitation was also come with a DOVE 7 Days Challenge. 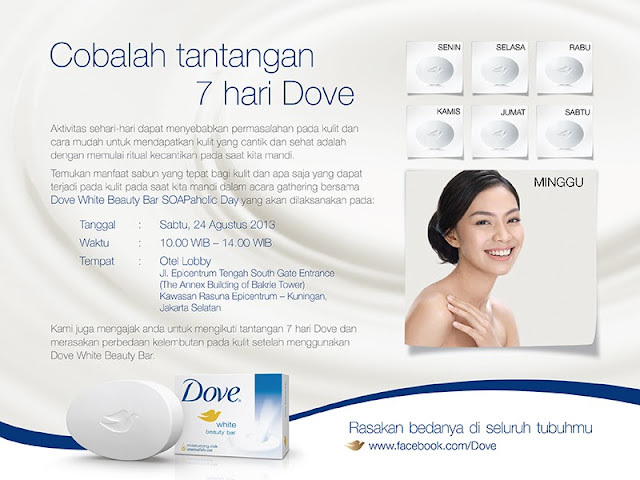 I really want to try it, challenge my self and really prove the difference using DOVE White Beauty Bar by my self. Because many international bloggers already did the challenge and the results are good. Stood between two tough choices, I chose to attend the event because it only happen once and I was so curious about the 7 Days Challenge. So, here I am! 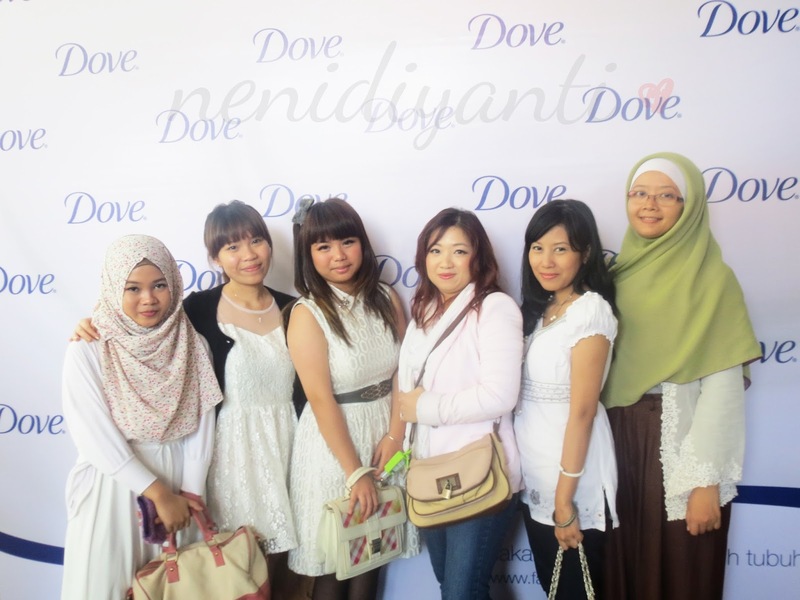 Attended the DOVE SOAPaholic Day at Otel Lobby. I was late on that day because the GPS routed me to wrong direction! I have never come to Otel Lobby before, so I need the GPS to direct me. Instead make a proper route to Otel Lobby, my GPS gave me a wrong direction, ended up in a dead-end and had re-route for three times but none of them direct me to Otel Lobby. So, yeah me and my boyfriend decided to saw the map and made a route by ourselves. Before joining the other participants at the talkshow, I made a time to capture this cabinet near the entrance. It looks good and well organized. Three random stacking of glass cubes with DOVE White Beauty Bar inside. What a good decoration! Determination of skin type is very important to choose the right care products. There are several things that must be considered, such as type of skin. The type of skin on the face is not necessarily the same as the skin on other parts of the body. Avoid bathing with hot water, cold water is better and also avoid bathing too frequently. It's recommended to take a bath twice a day and maximum in 15 minutes. A soap that makes your skin feel nonskid or "kesat" even just make your skin dry. In conventional soap - fluid is pulled excessively and our skin protein layer become swollen. This is what makes sense of nonskid on the skin. So, the very clean feeling or nonskid feeling after bathing isn't because the dirt all picked up, but because the body fluid is withdrawn. By the way, when I came there, the first thing I saw was all the participants busy with their gadget. I didn't have an idea what they were doing. Moments later, the MC, Amy Zein, gave announcement about three twitter winners. Then I realized they had been bussy tweeting since earlier. The seats for participants were well organized. But since I came late, I had no choice where to sit, so I picked a free seat at the back row. 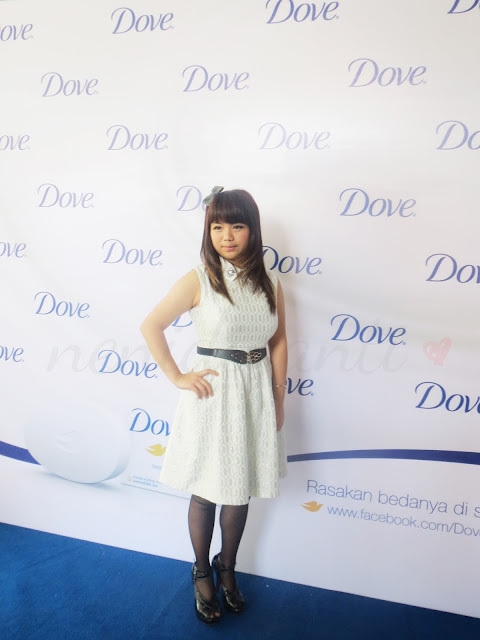 She's the second speaker at DOVE SOAPaholic Day. She told us about the speciality of DOVE White Beauty Bar. Here, I write some resume of her explanation that day. Surfactans are the actvie cleansing molecule, providing lather and solubilizing oils. 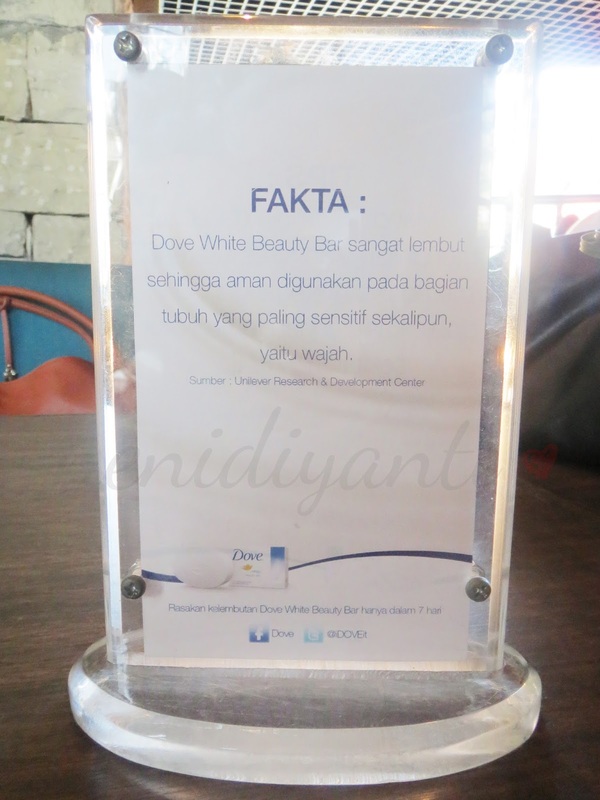 DOVE White Beauty Bar contains sodium laurly sulfate, cocamidopropyl betail and synthetic detergents. These substances are used by DOVE as the surfactans. The functions besides cleaning can also reduce damage to proteins in the skin. So our skin can become softer by using DOVE White Beauty Bar. 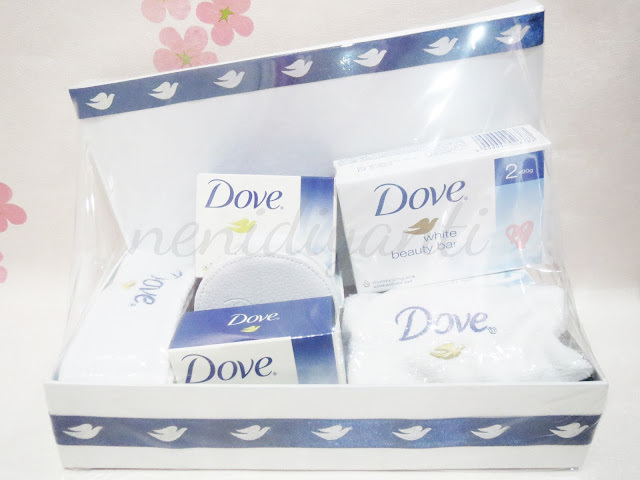 DOVE also contains some substances which function to moisturize our skin so our skin will be moist after bathing. DOVE adds petroleum jelly, fatty acids and soy bean oil as the moisturizing substances. 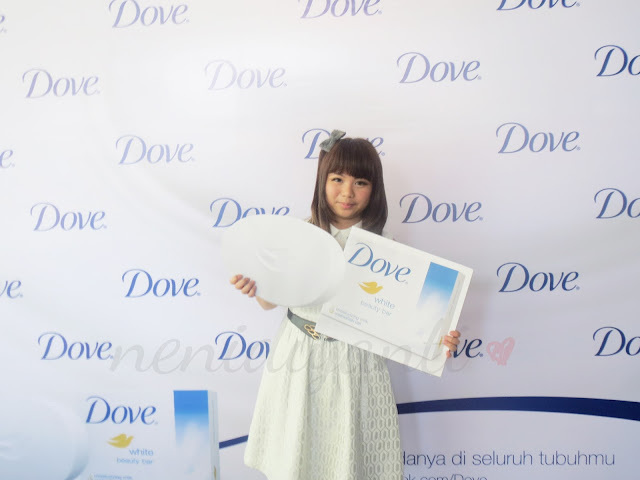 This substances also make DOVE become softer and milder than usual soap. The main star is fatty acids, because fatty acids is natural lipid in our skin and can substitute lipid lost when bathing. This makes DOVE different with the other soap in store. 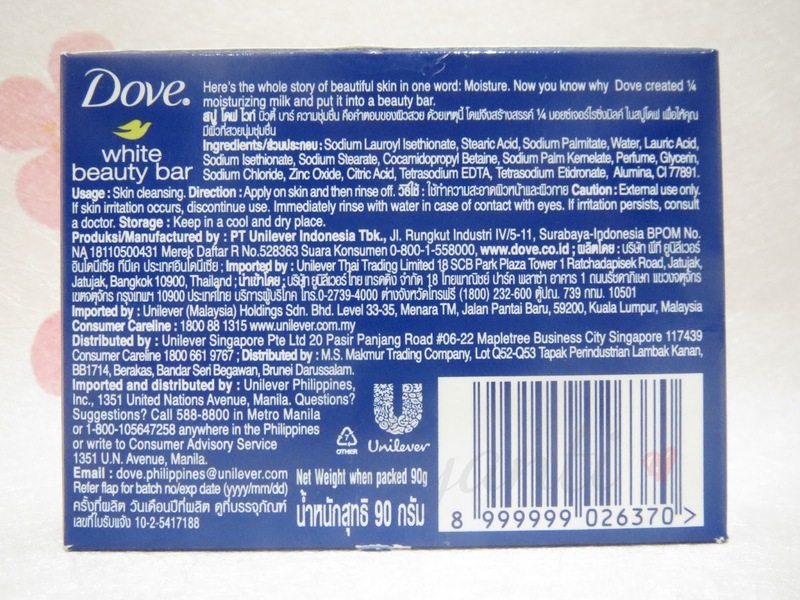 Other ingredients are the supporting substances in DOVE Beauty Bar. Structurants is function to forming structure the soap itself. Fragrance is also added because when we pick a soap, we tend to smell it first. If it smells good, we tend to pick it. The last supporting substances is preservatives. It is added to keep the soap structure remained stable in the long term. Those three main ingredients is combined in DOVE White Beauty Bar. Make it becomes a mild soap ; safe for every people, every skin type and all age range. Mostly soaps today are already using this technology (ultra mild technology), combined those three ingredients to make a mild soap. But, DOVE already implemented this technology since 1950. DOVE is a soap that does not cause dryness on our skin and it's already protect our skin moisture since the old time, even since I haven’t born. 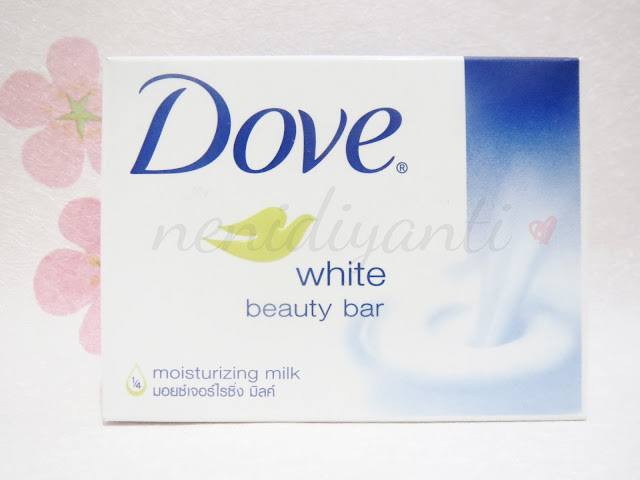 The other fact is pH in DOVE White Beatuy Bar is neutral (pH 7), same like pH in our skin. And also, ¼ ingredient in DOVE White Beauty Bar is moisturizing cream. 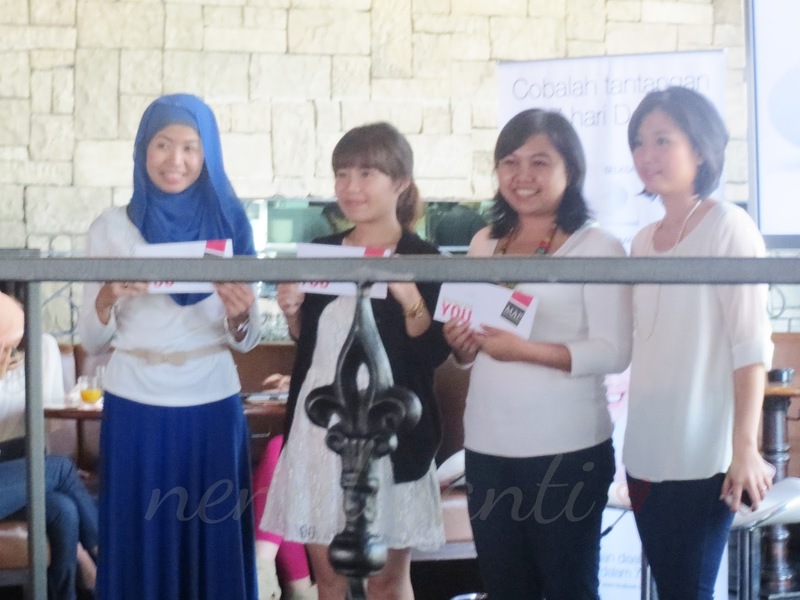 After the talks, Ms. Rini Maya Suspita did a pH Test on DOVE White Beauty Bar and two other brand soaps. Instead taking photos of the experiment, I decided to record it, so what you'll see in the video below is real. See the result of pH Test? The litmus paper on DOVE White Beauty Bar still in red, means it has neutral pH (pH 7). Meanwhile, the other soaps make the litmus papers turned blue. They don't have neutral pH, instead they are alkalic. She's the last speaker at the event. 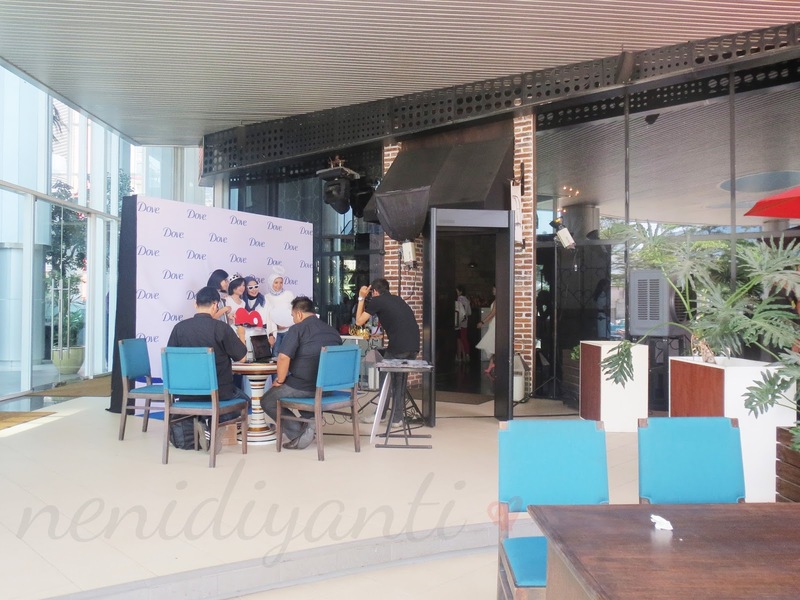 She was like sums up the whole conversation and also sharing about her baby experience using DOVE White Beauty Bar when her baby had skin problem. 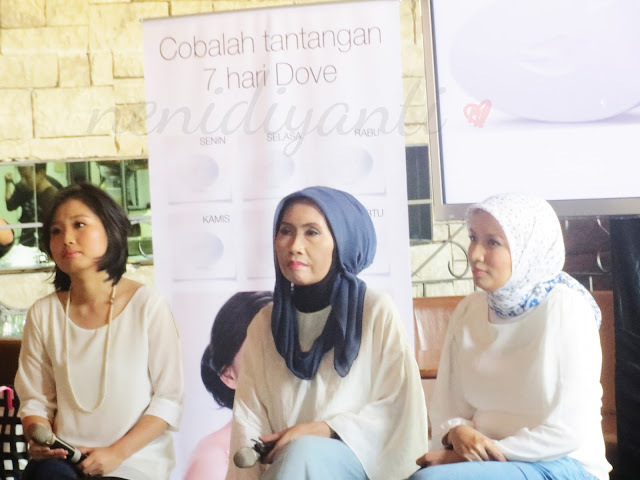 They are three speaker who talked at DOVE SOAPaholic Day. They were ready for Q&A session. There was a lot of questions asked, but I manage to write down some interesting questions. Q: Are there any long-term effects of using the non-mild soap with pH above 7? A: If our skin is dry, we could eventually exposed atopic dermatitis (hey I Suffered atopic dermatitis). And the folds of the skin may darken and look ugly. For the long term, there could be skin aging. Q : Is it okay if we used loofah when bathing? A : Honestly, it's not recommended because it can erode the protective layer of the skin. 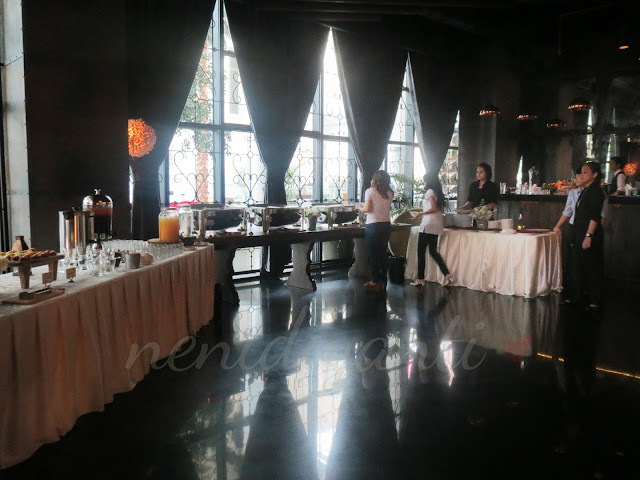 After the talkshow end, we were treated with buffet lunch. 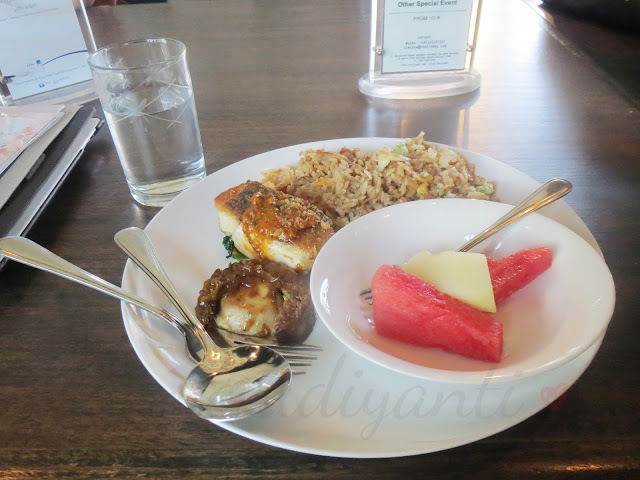 There was so many foods to choose, two kind of rice (fried rice and uduk rice) with one soup and three main courses. 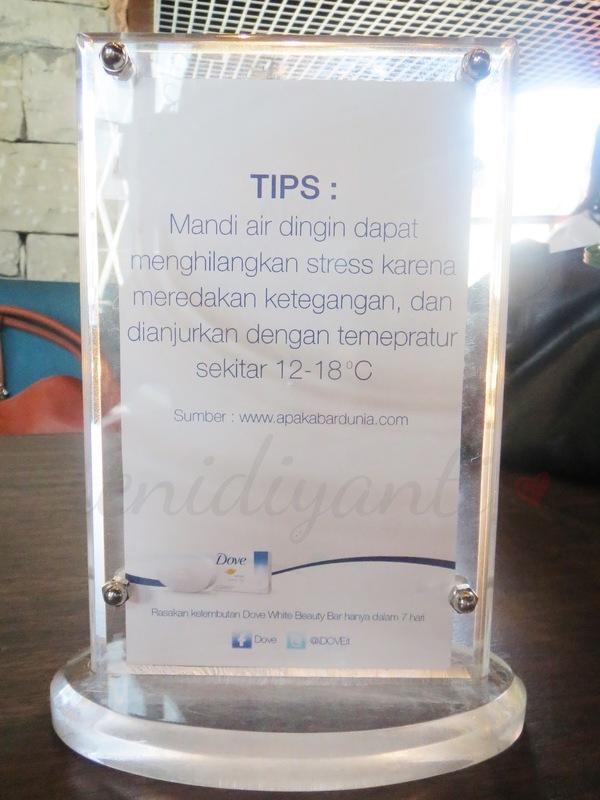 Not forget to mention ice tea, orange juice, mineral water and fingers foods. 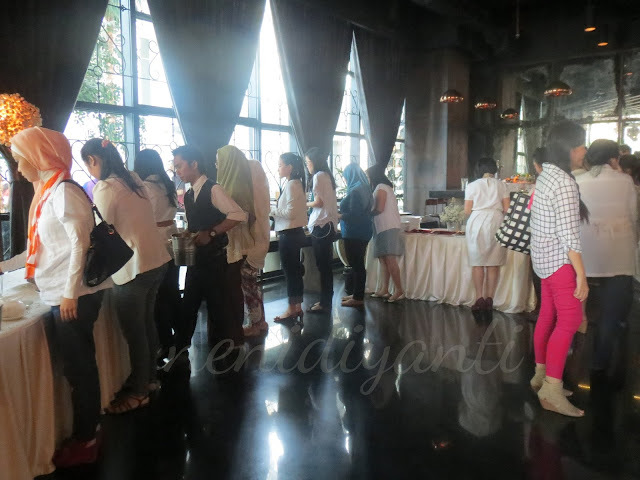 This is my lunch at DOVE SOAPaholic event. 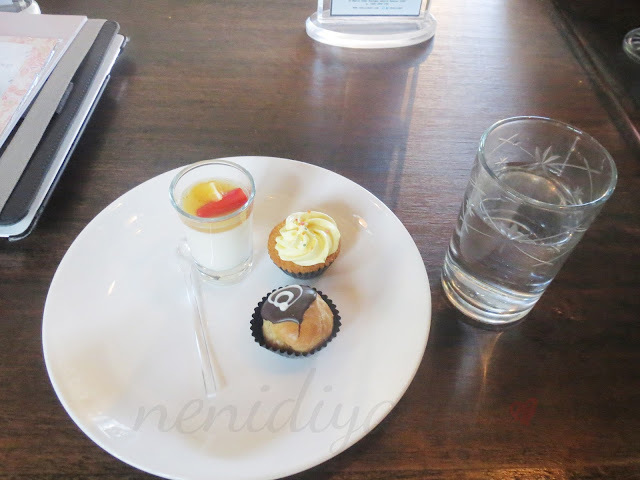 Provided by Ottel Lobby, the foods are really delicious. Uh la la~ I took fried rice with fried pan salmon and beef rollade. Also took two slices of watermelon and one slice of melon as dessert. I didn't see these cute cakes when I was taking my meal. I saw ci Carnellin walking with a plate full of mini cakes and it made me tempted to get some. All the participants were enjoying their lunch. When I was eating my lunch, I noticed this standing frame on my table. And I realized that DOVE wrote a tips and a fact on it. Whoaaaa... So informative! The last session was about the announcement of the best dress and best tweet winners. This girl became a double winner as the best dress and one of the best tweet winners. Look at her sleeve shirt, long skirt and her hijab, they really represents DOVE. 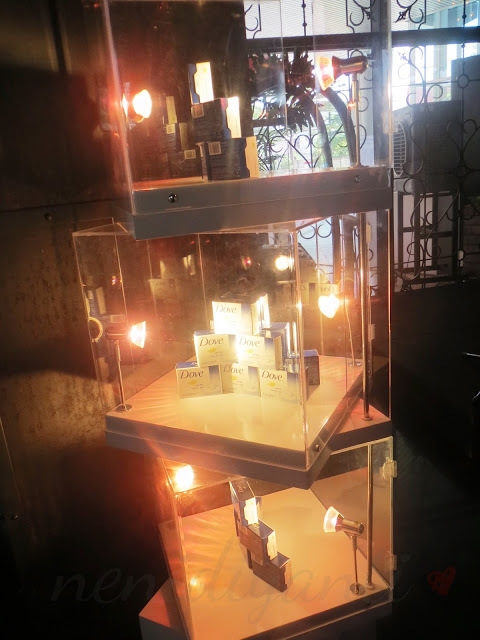 There are so many DOVE White Beauty Bar (ﾟДﾟ) Let's pick one lucky soap! DOVE White Beauty Bar box is dominated with white and blue color. A DOVE logo also printed on the front side of the box and it's in yellow color. 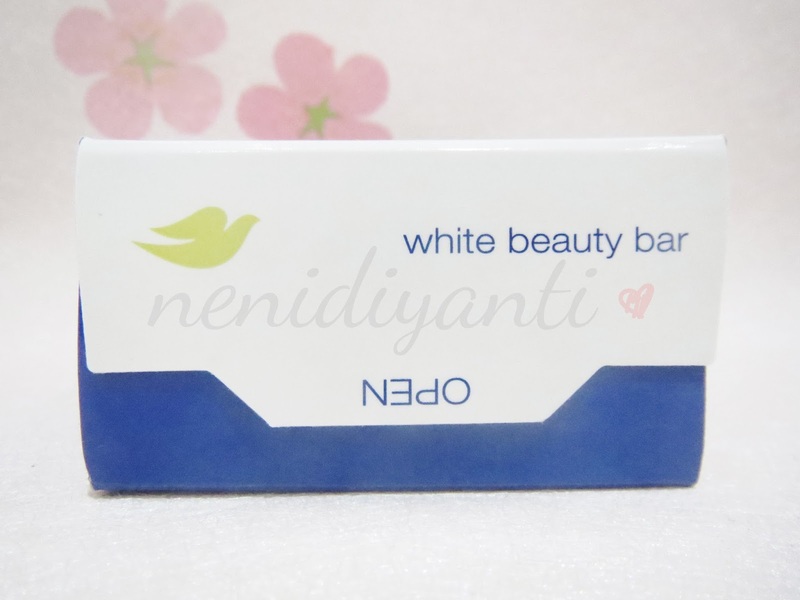 On the back side, you can find a short description about the product, the ingredients and how to use DOVE White Beauty Bar. On the right side, you can find the expired date printed on blue section of the box. It doesn't look clear in this photo, but you can read the expired date clearly when you saw the box in real. The other side is where you can open the box. You can open from the any sides you want though, but this side just make you easier to open the box. 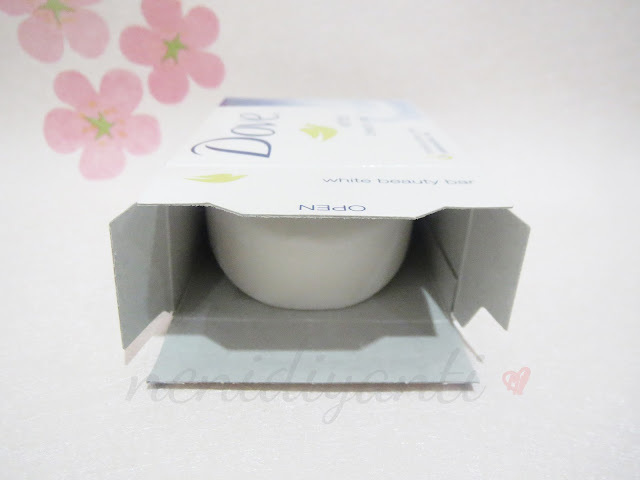 Here's the DOVE Beauty Bar inside the box. The box has simple design and easy to open. The box itself is made by cardboard and sturdy enough to protect the DOVE bar inside. This is the DOVE White Beauty Bar from front view. It's oval shaped and has a dove logo embossed on it. DOVE White Beauty Bar is thick. Don't worry, you won't loose it after just a few days usage. I already use it for more than seven days and it still thick. Just put it in a soap case to protect it from water because too much water exposure can make it gone soften faster. Do you see the curve? 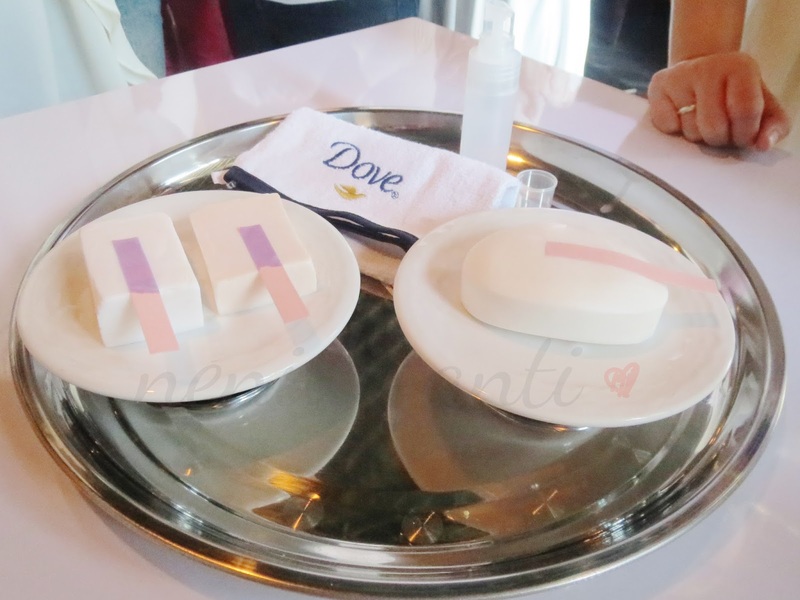 Yes, DOVE White Beauty Bar is oval shaped with a curve, not like other soaps with flat dimension. This curve makes me easier to grip the soap. DOVE White Beauty Bar is not too big and not too small. It's fit perfectly on my (small) palm. It's also easy to grip and won't slip from your hand easily when bathing. 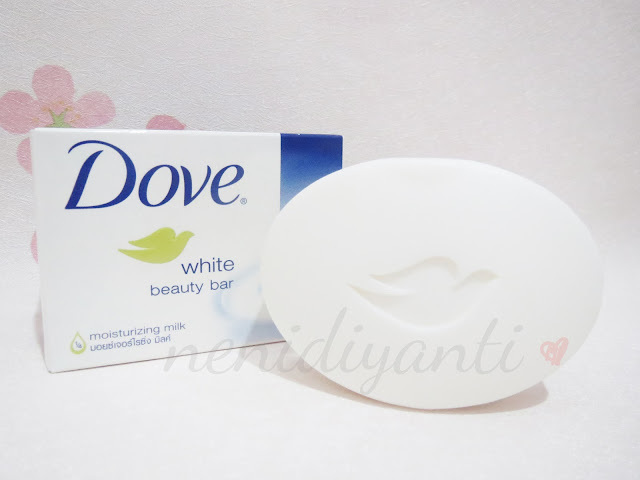 DOVE White Beauty Bar is a mild soap, so don’t expect you’ll get much foam while bathing. Instead, you get a (very) less foam due to its mild formula. Yes, my doctor said that a mild soap tend to have less foam and less irritated than the other soap. But don’t, worry, you still get satisfied feeling after bathing and you’ll feel your skin becomes more moist and hydrated a moment after bathing. Don’t forget to apply your favourite body lotion for the maximum moisturizing because DOVE is an initial step to get moist skin after bathing. DOVE helps you to get healthy skin because it’s different than the other soap. It's time for the 7 Days Challenge! Honestly, I was worried about this 7 Days Challenge, since I have terrible skin condition. My skin is very dry, especially my back of palm (right hand). It's suffered with atopic dermatitis and it makes my skin becomes extremely dry. 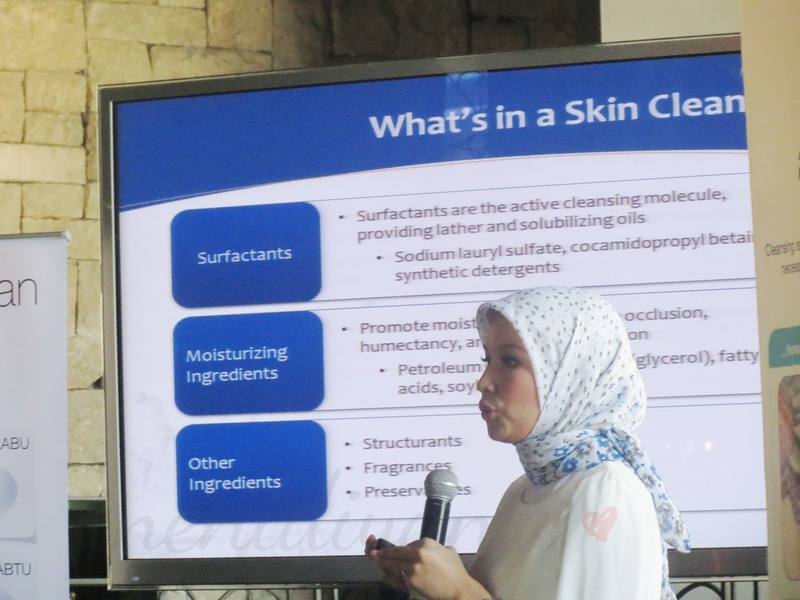 This is just same like what dr. Lilik Norawati, SPKK said at DOVE SOAPaholic event. dr. Lilik said that dry skin condition can lead into atopic dermatitis. And for the long-term effect, skin aging can occur. The folds of the skin may darken and look ugly and this will make us feel unconfident. And honestly, I feel the same like what all she had said. I got very dry skin condition and now it leads my skin into atopic dermatitis. It's itchy, hyperemic and makes the skin flaky. But, dr. Lilik also said that by using a right and mild soap, we can fight against dry skin. The problem is, I haven't found the right soap for my skin. By using a mild soap, we can prevent the dry skin condition and at the same time moisturize our skin (if we already had dry skin condition). Disclaimer : I took this photo on August 24, 2013 at around 8.30 PM. I didn't edited or photoshop it just because I want to join Dove 7 Days Challenge. This is my (real) back of palm's condition. It looks horrible, right? 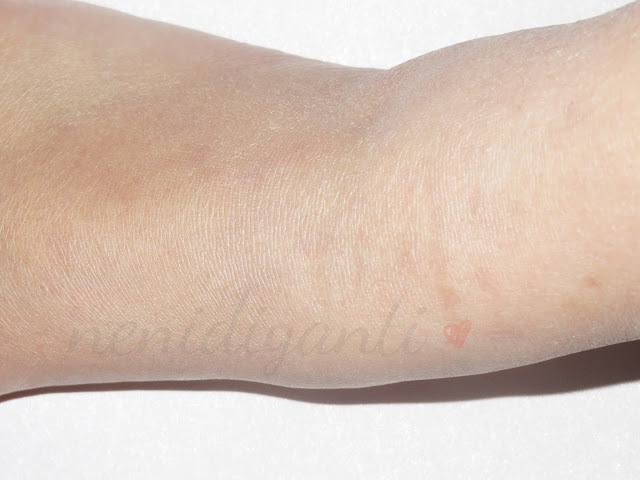 Well, this skin condition is happen because I suffer atopic dermatitis (well known as eczema). I got this due to some provoking or predisposing factors, such as stress and genetic. I've consulted with some dermatologists in Jakarta, one of them and the one who took care of my skin condition recently, dr. Lusiana Dameria, SPKK said that I may have to deal with this skin condition forever. Eczema can be treated, though. But from several times of anamnesis and consultation, looking my medical history and also skin check, she found out that I'll get this eczema back whenever I got stress. Been thinking that she might be wrong, but I do come to her again and again because this eczema is always coming back (recurrence). And looking to the time history, it's always after exams when I came to her. Yes, stress is the provoking factor to my eczema. Note : I'm sorry if you have to see something horrible. 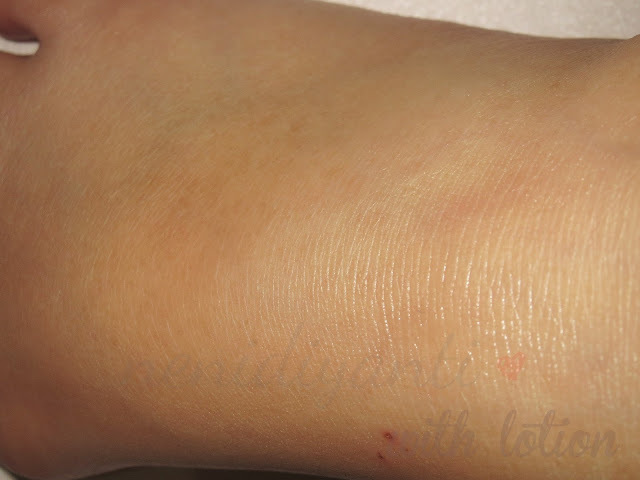 When we looked it closer, we can see that my skin looks very dry and hyperemic (redness). It's also itchy and if I scratch, it may cause lesion on my skin. And oh that flaky skin is horrible! Not only hand, but my foot instep is also dry very dry. It's cracked like badlands. Horrible! My foot instep is not suffer with eczema, it's just dry, very very dry. I routinely apply hand and body lotion (or even body butter), but nothing happen. It still dry very dry. I got a prescribed lotion from my doctor and it helps a lot. Though that prescribed lotion can moisturize my skin very well, I always see my skin becomes like this a moment after bathing, dry and barren like badlands. It's really cracked (ﾟДﾟ|||). 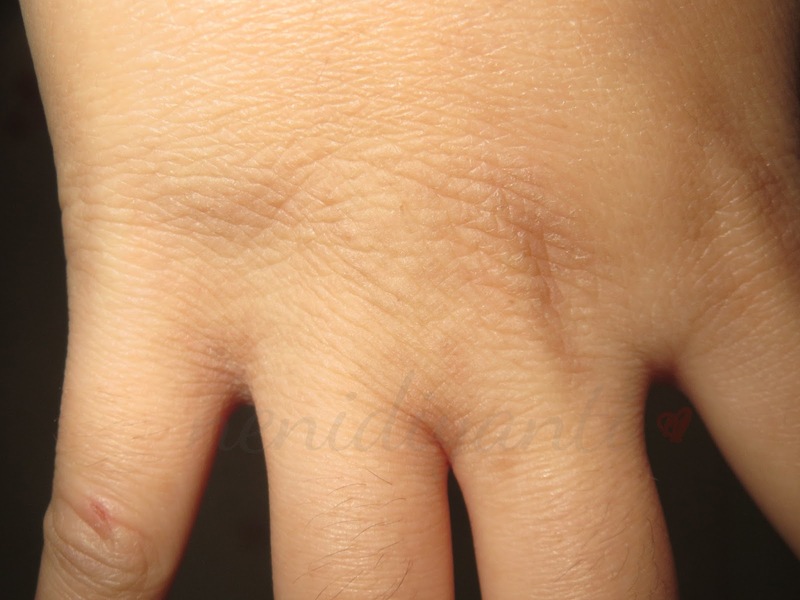 And this photo is really depict that very dry skin condition which look like badlands! This is the result after my first time using DOVE White Beauty Bar. I took this photo right after I finished showering. My back of palm doesn't look hyperemic, although it still looks dry. Those flaky skins are still there, but not too much. 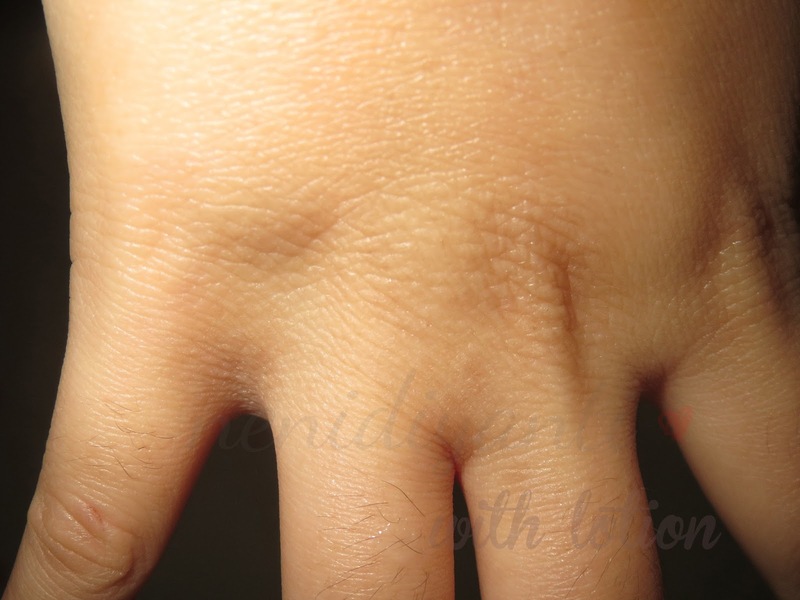 Look the area between my ring finger and little finger? That area seems better now, much better. 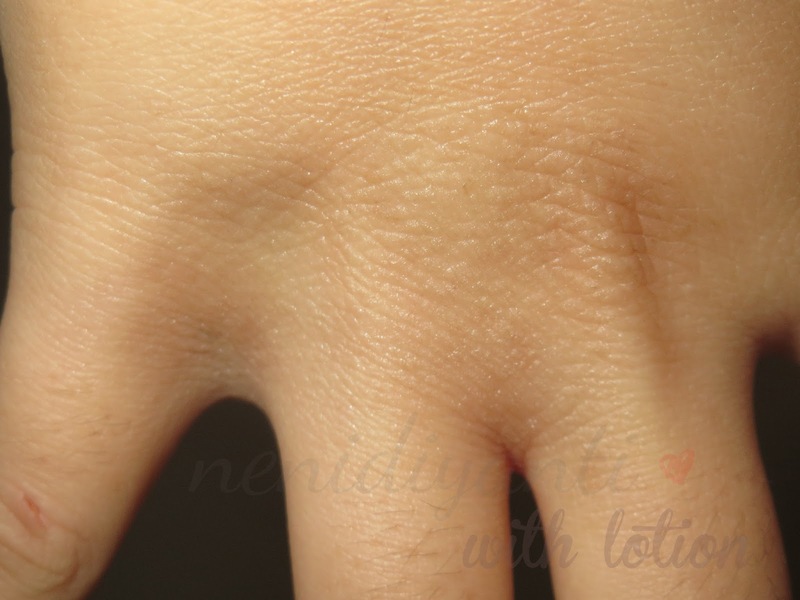 It looks moist, not differ too much after lotion application. Oops..! Sorry, I didn't take a photo after I apply lotion on my hand at day-1. 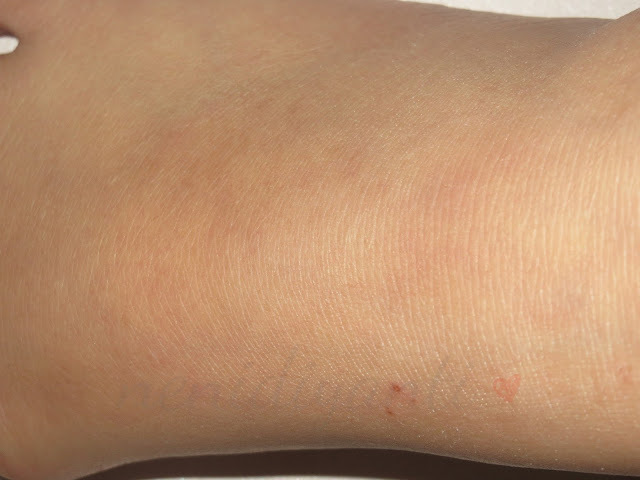 My foot instep condition after using DOVE White Beauty Bar. It looks different from BEFORE photos right? On the second day, the area between my little finger and ring finger seems better much better. 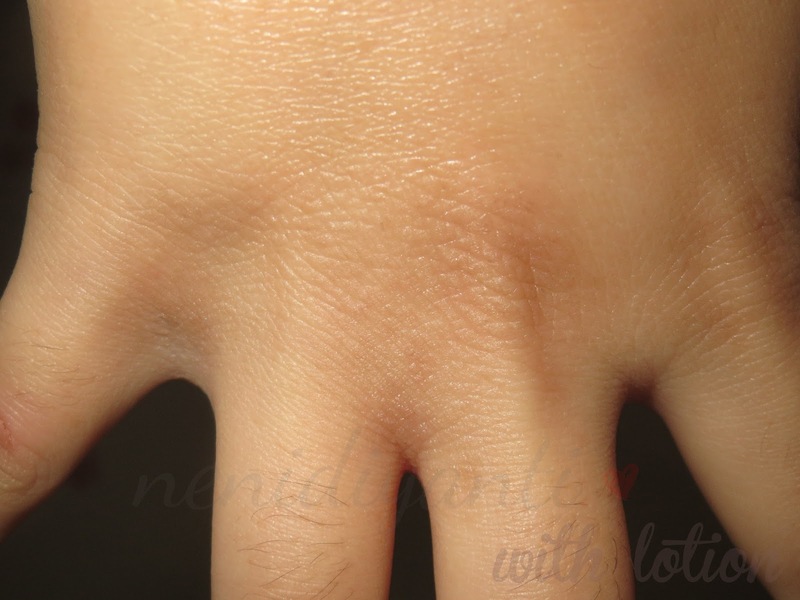 I know in this photo doesn't show you a huge different, but in real life when I touch my skin, it feels softer. I use a prescribed lotion, so I'm not intend to promote any brand of lotions. I just wanna show you my skin condition after using DOVE White Beauty Bar and lotion application. DOVE White Beauty Bar is really help the lotion to make my skin looks moist. 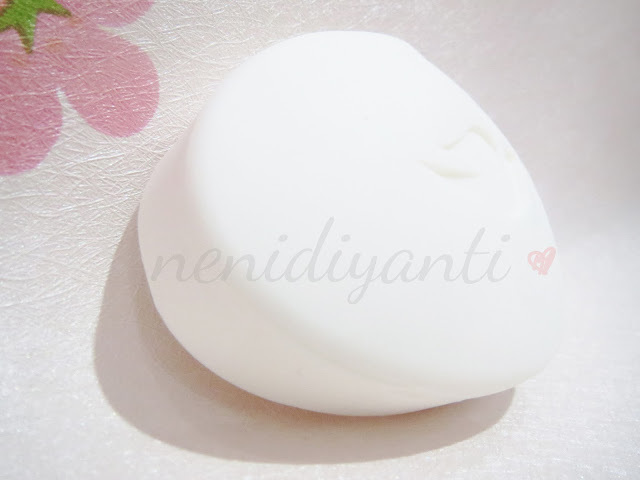 Before using DOVE White Beauty Bar, my hand is dry after bathing and I must apply much amount of lotion to make it looks moist. But since using DOVE White Beauty Bar, a thin layer of lotion is just enough to make my hand look moist (and greasy) haha. There's just a slight difference after I apply lotion on my foot instep. The lotion just make it looks greasy. Day by day my skin becomes better and better. I'm not lying. This is the true result and photo taken after I finished showering. I just can't believe it that by using a mild soap can help my skin heal faster. My doctor also suggested me to use a baby soap for bathing since earlier. I did, but just for one bar. I just don't like the feeling of using baby soap. It smells so soft (you know the baby soap smell, right?) and I don't get a clean feeling after bathing. 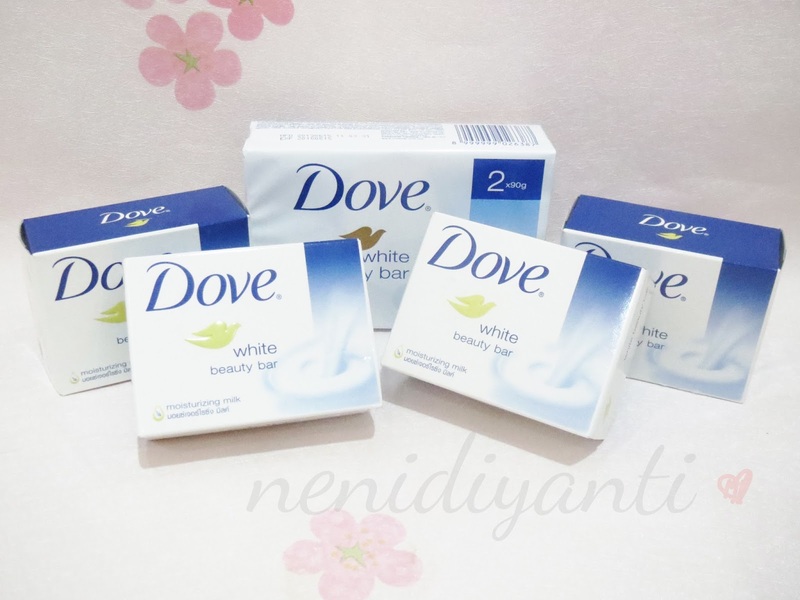 Different with DOVE White Beauty Bar. Although it's a mild soap (just like a baby soap), but it gives me clean feeling after bathing. And while applying DOVE White Beauty Bar, I just feel like I apply lotion on my skin. I can say this because my prescribed lotion gives me a greasy yet moisturize feeling and so does DOVE White Beauty Bar. It doesn't look too much different without lotion, right? It just looks greasy. There's no much difference after applying lotion. I think DOVE White Beauty Bar and my prescribed lotion works well on my skin, make my skin heal faster, both also moisturize it. It seems worse than the previous day. But, in fact it happen because I scratched my hand before I take this photo. When I scratched my hand, it can instantly irritate my skin. My foot instep doesn't show a huge difference between today and the previous day, but it's okay. As long as it doesn't dry and flaky. My skin seems much better. No more redness, no more flaky skin (at least it becomes less than the past 5 days). Although there's still a mark on my skin (below my middle finger), but the result in day-6 is already amazing for me. What's the different between this photo and the photo above? Just slightly different! After lotion application, my hand looks greasy and kinda have a layer of lotion applied on it. My foot instep seems normal now. No more badlands! Yeahhh! The lotion application helps to moisturize my skin. DOVE White Beauty Bar already done its action to protect my skin's lipid layer from erosion while bathing and fight against skin dehydration and also dry skin. It's true that by using a mild soap, we can prevent dry skin. 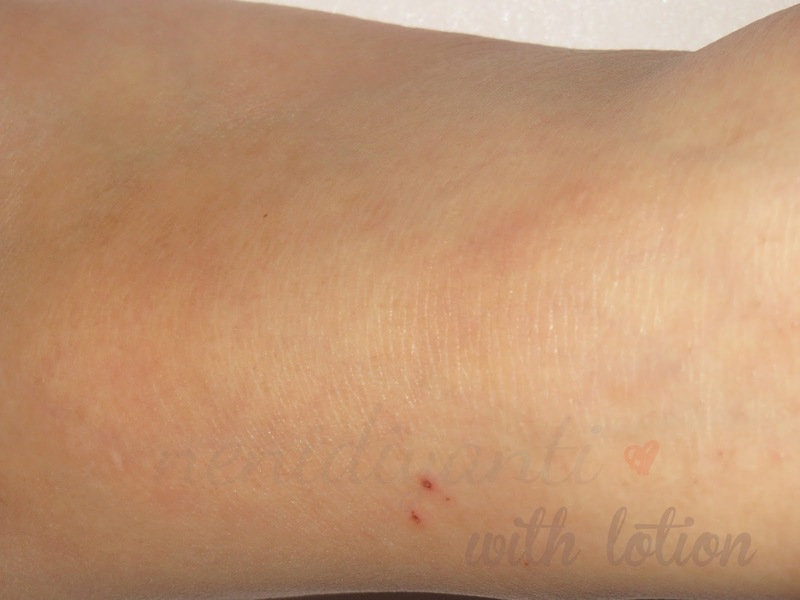 My foot instep looks much better than before I use DOVE White Beauty Bar. It's really a mild soap which can clean our skin but also prevent erosion of the fat layer of the skin ; this thing is different from other soaps. 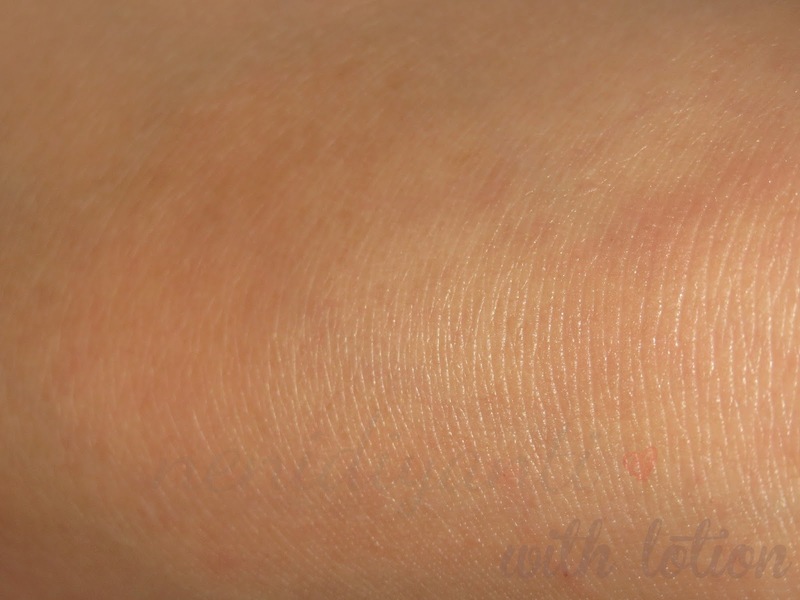 Here's the changing on my hand after doing DOVE White Beauty Bar 7 Days Challenge. You can see the photo with number zero (0) is my hand condition before I take the challenge and the photo with number seven (7) is my recently hand condition. I completed 7 days challenge and prove the difference by my self. So, it's true when the doctor said that a mild soap can heal the dry skin. I'm already prove it by my self and it does happen on my own hand. From the dry, flaky, itchy, hyperemic skin, now it becomes moist and seems good. 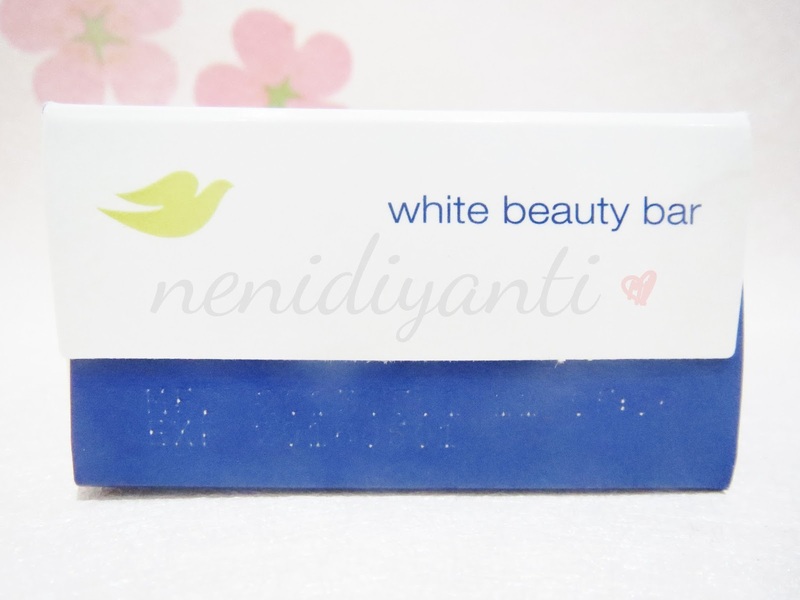 I'm very satisfied with the result and will continue using DOVE White Beauty Bar daily. The dry skin is not only on my back of palm, but also on my foot instep. Before I take the 7 days challenge and starting using DOVE White Beauty Bar, my foot instep was dry and looks like badlands. 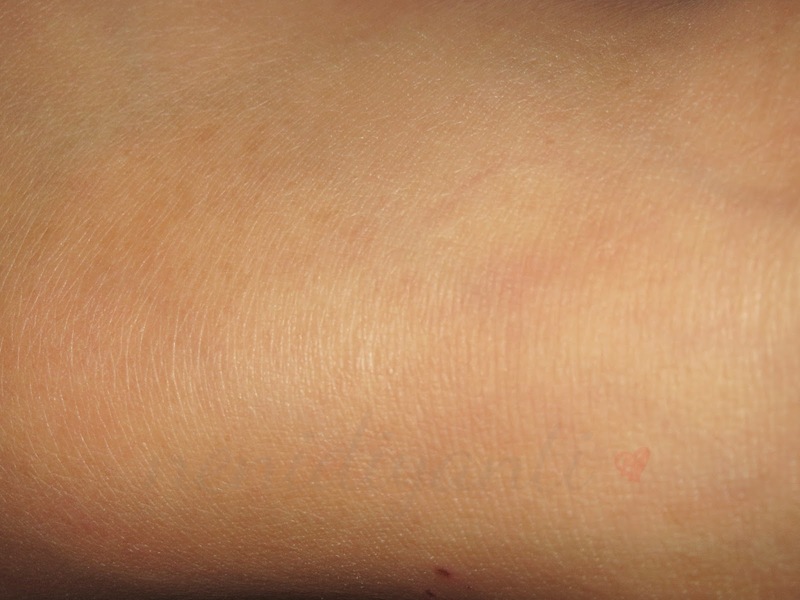 But after 7 days using DOVE White Beauty Bar, now you can see that my foot instep seems beter. It has moist skin now. Take a new step to tackle and prevent dry skin by using DOVE White Beauty Bar for (at least) 7 days and you can also join the challenge. Brave your self to get a better skin. You won't regret at all. Join the DOVE 7 Days Challenge in femaledaily.com. 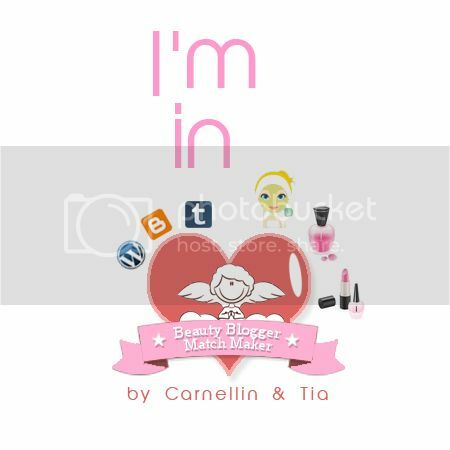 Sign up now (or sign in if you already have an user ID) and going to thread http://www.femaledaily.com/showthread.php?p=3474616. Done 7 days challenge and share your experience there. Get a chance to win IDR 500.000 shopping voucher for five winners! Claren : hahaha mak coba lha kalo gitu! emejinggg!!! !